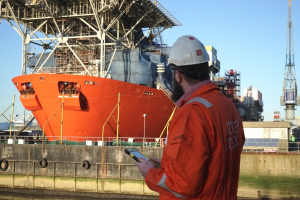 Geert Schouten, director at ICT Strategie B.V.
Damen Shiprepair Rotterdam decided to make use of a smart data management software system, called Shipbuilder, to handle the complex conversion of a large FPSO. Marc Derks will present the scope and complexity of such a conversion, which risks and challenges are involved, how to handle this in a project organisation and what the results are of their strategic decision for Shipbuilder. Geert Schouten will explain how such an extreme large volume of data can be used successfully by all disciplines and stakeholders without disappearing in tens of thousands of emails, spreadsheets, documents and alike. The KNVTS Amsterdam is as a Division active on various social media. You can follow us on Facebook and Twitter: KNVTS Amsterdam and on LinkedIn: KNVTS.